Every time you head to Walt Disney World you notice new and different things. Subtle features catch your eyes, especially with the Disney style architecture. 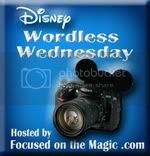 This week, the Disney Wordless Wednesday theme focuses on Disney Architecture. I could show different views of the castle, but I have some different items from around the parks and at different resorts. Those are great pictures! Makes me want to go back. Wait, who am I kidding? I am always ready to go back! Great pictures! Disney does such an amazing job on, well, pretty much everything. lol Sometimes you forget how beautiful the buildings (not just the castle and other icons) really are. Love your choices! I love the train station on Main Street. Love all your photos!! Thank you for sharing! These pictures are great! I love the one of the train station. The castle may be the most “iconic” image of the park, but seeing the train station makes you realize you’ve really arrived and the fun is about to begin! What great examples of Disney architecture! All so unique! I especially love the Grand Floridian♥♥ It always takes my breath away. Thanks so much for sharing and for joining in on the Disney WW Blog Hop fun today! Great shots, I love all of them. Love the Big Wheel..
Those are great shots! Nice captures! Great examples of Disney architecture! My favorite is the Imagination building!